The Central Iowa Chapter of Bikers Against Child Abuse invites everyone to attend their 2nd Annual Biker Bash on Saturday, August 20th at The Ridgemont, 7460 Hickman Road in Windsor Heights, a subburb of Des Moines, Iowa to raise awareness and funds to help battle the epidemic of child abuse. "Entry to this event is free, so come learn about who we are and what we are about all while enjoying all sorts of entertainment and specials inside," said Adam "Psycho" McNeely, merchandiser and events coordinator for Central Iowa BACA. 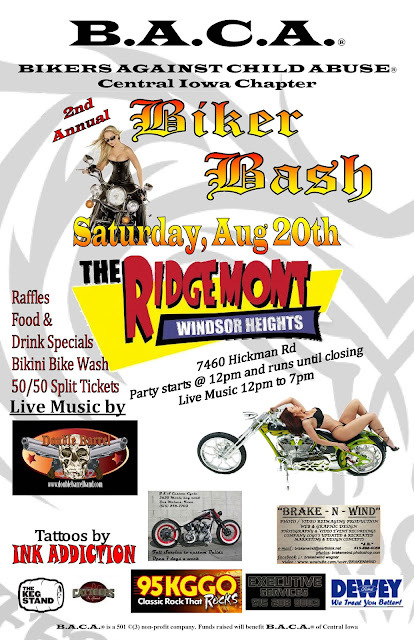 "Come on out and party with B.A.C.A., check out our vendors, get some new ink, feed your belly, grab a cold one, and rock out to some great live music... and don't forget to bring a dirty bike." The event starts at Noon on Saturday, Aug. 20th and ends at closing time (2am) Sunday. B.A.C.A. was founded in Utah in 1995 by John Paul "Chief" Lilly, a licensed clinical social worker, part-time faculty member of Brigham Young University and registered play therapist, who had spent nearly two decades advocating for abused children. What started as a way to reach one frightened 8 year old boy, became a circle of bikers with chapters in Utah, Oklahoma, Missouri, and Texas, then across the country and in other parts of the world. To locate a B.A.C.A. chapter in your state or country, with links to BACA Nation Radio Forums and more, visit (bacaworld.org) BACA International, "Breaking the Chains of Abuse."